Imagine a scene some 4,000 years ago when a highly respected member of a Bronze Age tribe died, they may have been killed in some conflict or just simply died of old age. Either way the family and other tribal members respected them enough to give him or her a high status burial. In such regard was the deceased held that a mound/cairn which already contained another burial was opened up and a stone lined burial chamber was built next to the original incumbent. It may well be that they were related or held a similar chieftain’s rank, hence the reason for the newly deceased person to be interred in what was a special place. The very building of the kistvaen was no mean fete as five huge slabs of granite had to be dragged to the burial mound and the stone-lined chest constructed. There probably was a burial ritual whereby the body was either positioned foetus-like into the granite coffin or cremated and the ashes placed in a beaker and deposited in the grave along with some personal grave goods. This was probably followed by much weeping and wailing that culminated in a wake-like feast of some kind, all to show the tribe’s sadness and deep regard for the dead person. 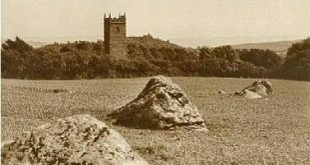 The mound or cairn was sealed and the departed soul was left to look out over the vast range of Dartmoor hills for eternity, maybe the spirit of the deceased was expected to guard the tribal lands and ward off any hostile encroachment. We will never know the true significance of this burial ritual but it doesn’t take a lot of working out to realise that to those prehistoric people it was an act of deep sacred belief in some spirit world that signified respect for the departed. I would also imagine that if, in their time, anybody dared desecrate those graves they would soon find themselves floating in the nearby river Teign. Now imagine a scene in 1879 where one Samuel Slade and possibly some local labourers are setting about that ancient burial mound with picks and shovels. Suddenly the sound of metal on granite rings out like a church bell, eagerly there is a scrabble with the shovels to see what had been found. Out of the peat comes the first kist to have been buried in the mound and soon bar irons are shoved under the lid in order to prize it off. Unlike today, intrusive archaeology was very much the norm with the sole intent on finding ‘treasure’ hence nobody would have had any qualms about simply ripping of the kist cover. As work continues the second kist is found and Slade decides to bring in some help in the form of William Pengelly who is the founder of Torquay Museum. By the time the two men return to the dig it’s discovered that other’s have rifled the kist and all that remains are some scatters of pot and flint tools. Today it probably would have been possible to date the burial from the pottery but sadly that information was not available in 1879. Somewhere along the line Pengelly comes across Robert Standerwick who owns the land on which the kistvaens lie and manages to persuade him to donate the second kist to the Torquay Museum. Accordingly on the 17th of March 1880 the grave is taken to Torquay where it is re-instated in the floor of the museum’s entrance hall as an permanent exhibition. It must be remembered that in the 19th century people were not so sensitive to the sanctity of human burials and the kist would have probably been a great attraction for the museum. Now let’s rejoin the 20th century when three events occur, firstly the death of Jack Wigmore who was the one-time Chairman of the Dartmoor National Park Authority, secondly, a decision was made to commemorate his life-time efforts by constructing a memorial garden at the back of the High Moors Visitor Centre and finally the Torquay Museum decided the place was becoming crowded and the kist was basically ‘in the way’. Somebody then came up with the idea to loan the kist to the Dartmoor National Park Authority in order that it could become a feature in the memorial garden. Ergo in 2004 the kist was transported from Torquay to Princetown where it was re-assembled in the front of the memorial garden. Consequently visitors to the centre can now gawk out of the rear window, sorry – information point, onto the garden where the kist sits forlornly in the foreground. Apparently the reconstruction has faithfully reproduced that of the 1880 with its intended alignment to the south-east. There can be no argument whatsoever that during his lifetime Jack Wigmore worked tremendously hard for the good of Dartmoor and as such merits a memorial to his memory. But to place another persons ‘memorial’ as centrepiece for visitors to ‘admire’ has to be verging on the sacrilegious. It can be argued that in 1880 Slade and Pengelly were acting out of ignorance and the thinking of the time meant that little regard was shown to such relics but in the 21st century we should know a lot better. The technology of today means that it would be possible to faithfully replicate the kist and put that on display if so desired. Imagine that in 4,000 years time somebody dug up your grave and placed it as an exhibit in a visitor’s centre? It can be argued that in the interests of ‘education’ which caters for all ages the kist serves as an easily accessible and authentic example of a Bronze Age burial. But why not simply direct the majority of people two miles down the road where after a short walk of 600 yards they can see an original kist in-situ? Then take the original Thornworthy kist and re-instate it where the Bronze Age people wanted to bury and honour the remains of their departed – lack of funding.